Now our popular "Holey Roller" bars are available for your 2008-2013 Bagger! Fits Street Glide, Electra Glide Ultra Classic, Electra Glide Ultra Limited, and CVO models. These will not fit Road Glides. These are specifically made to fit the Harley "Batwing" fairings. Special bends and angles allow these to fit perfectly with your style of fairing, not just "they'll work". Unique "staggered" fitment for superior weld strength and cool look! 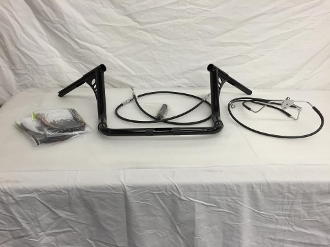 Complete cable kit is for 2008-2013 Harley-Davidson Baggers with the "batwing" fairing with ABS & NO ABS.